100920 is rated 5.0 out of 5 by 4. Rated 5 out of 5 by Moto58 from Cheaper alternative My mustang came with all aeromotive equipment and one of the braided lines sprung a fuel leak. The jegs lines are of the same quality and a fraction of the cost. It was a great buy. Rated 5 out of 5 by Daryl V from Great quality Always happy with this fuel line. Works well with the new ethanol gas. Rated 5 out of 5 by Bob 408 from Great Quality and well packed Originally purchased complete kit from Jegs about ten years ago and needed to replace fuel lines. Looks great and fitment was perfect. 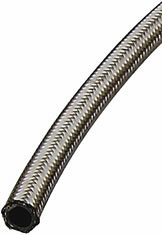 Yes, this hose can be used for transmission cooling lines. Can this hose be used for A/C lines? The JEGS Pro-Flo hose is not acceptable for A/C hose.